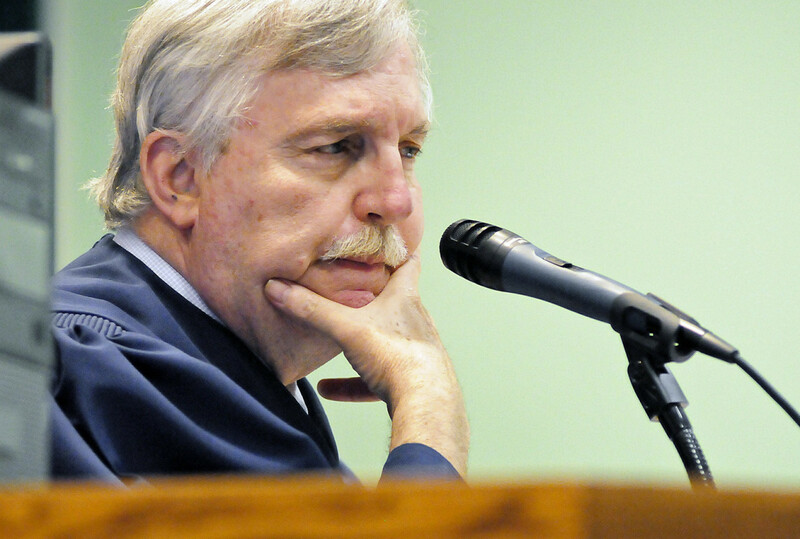 Judge Douglas R. Driggers listens while Attorney C.J. McElhinney speaks on behalf of the Las Cruces Sun-News and New Mexico in Depth during Thursday's hearing. A state agency can continue to keep secret most of an audit it used last year to suspend funding for 15 health organizations and spark criminal investigations into potential Medicaid fraud, a judge ruled Thursday. The ruling marks the second time in nine months that Douglas R. Driggers, a district judge in Doña Ana County, has agreed with the state’s Human Services Department (HSD) and Attorney General’s Office (AG) that protecting an ongoing criminal investigation trumps the public’s right to information. New Mexico In Depth and the Las Cruces Sun-News, which sued to try to win release of the audit last year, are considering whether to appeal the judge’s latest ruling to the state’s Court of Appeals, their attorney, C.J. McElhinney of Las Cruces, said Thursday. At Thursday’s hearing, Scott Fuqua, a lawyer for the AG, which is representing HSD, said little had changed since Driggers ruled in November that the audit could be kept secret. The Attorney General’s Office has estimated that it could take another six and a half years to complete its investigations into all 15 organizations. Since June 2013, the AG has cleared one of the 15 organizations – The Counseling Center of Alamogordo. In that time, it has released portions of the audit pertaining to Easter Seals El Mirador in Northern New Mexico and The Counseling Center, which operated until the Medicaid freeze led to its closure. The AG initially cleared Easter Seals El Mirador but has since reopened its investigation at HSD’s request. The news organizations contend the public has a right to know now what information contained in the audit justified the chaotic transition HSD sparked last year when it froze funding and brought in firms from Arizona to fill the gap in services. Tens of thousands of New Mexicans in need of behavioral health services – treatment for drug addiction, depression and other issues – were affected. Release of the full audit, which was conducted by the private firm Public Consulting Group (PCG) for HSD, would allow the public to decide whether the freezing of Medicaid funds was justified, the news organizations have argued. New Mexico In Depth and the Las Cruces Sun-News are asking the N.M. Court of Appeals to overturn a ruling allowing last year’s audit of 15 health organizations to remain secret.